A new study on the internal anatomy of the skull of Tiktaalik roseae uncovers more evidence of how life transitioned from water to land. Newly exposed parts of Tiktaalik roseae—the intermediate fossil between fish and the first animals to walk out of water onto land 375 million years ago—are revealing how this major evolutionary event happened. A new study, published this week in Nature, provides a detailed look at the internal head skeleton of Tiktaalik roseae and reveals a key intermediate step in the transformation of the skull that accompanied the shift to life on land. A predator, up to 9 feet long, with sharp teeth, a crocodile-like head and a flattened body, Tiktaalik’s anatomy and way of life straddle the divide between fish and land-living animals. First described in 2006 and quickly dubbed the “fishapod,” it had the fish-like features of a primitive jaw, fins and scales, as well as a skull, neck, ribs and parts of the limbs that are similar to tetrapods (four-legged animals). The initial 2006 report did not describe the internal anatomy of the head, because those parts of the fossil were buried in rock. In the Thursday, Oct. 16 issue of Nature, the researchers describe this region and show how Tiktaalik was gaining structures that could allow it to breathe air and support itself on solid ground. “We used to think of this transition of the neck and skull as a rapid event,” said Neil Shubin, study author and project co-leader, “largely because we lacked information about the intermediate animals. Tiktaalik neatly fills this morphological gap. It lets us see many of the individual steps and resolve the relative timing of this complex transition,” added Shubin, Professor and Associate Dean of Organismal and Evolutionary Biology, and provost of the Field Museum. A new study of Tiktaalik roseae (center), a 375-million-year-old transitional fossil, highlights an intermediate step between the condition in fish like Eusthenopteron (bottom) and that in early limbed forms like Acanthostega (top). The new data are described in a paper by Jason Downs, Ted Daeschler, Farish Jenkins, Jr. and Neil Shubin in the Thursday, Oct. 16 edition of the journal Nature. Ted Daeschler of the Academy of Natural Sciences and co-leader of the team that discovered Tiktaalik, noted, “The new study reminds us that the gradual transition from aquatic to terrestrial lifestyles required much more than the evolution of limbs. Our work demonstrates that, across this transition, the head of these animals was becoming more solidly constructed and, at the same time, more mobile with respect to the body.” These changes are intimately associated with the change in environment. Fish in deep water move and feed in three-dimensional space and can easily orient their bodies in the direction of their prey. A neck, seen for the first time in the fossil record in Tiktaalik, is advantageous in settings where the body is relatively fixed, as is the case in shallow water and on land, appendages support a body planted against a substrate. Another important component of this transition was the gradual reduction of the hyomandibula, a bony element that, in fish, coordinates the cranial motions associated with underwater feeding and respiration. In the transition to life on land, the hyomandibula loses these functions, and the bone becomes available for an eventual role in hearing. 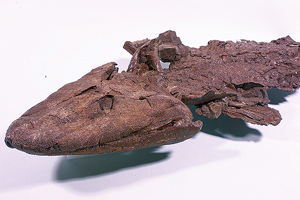 Having multiple Tiktaalik specimens enabled the researchers to prepare the fossils in ways that showed the bones of the head in “exceptional detail,” Downs said. The team discovered Tiktaalik roseae on Ellesmere Island in the Nunavut Territory of Canada, 600 miles north of the Arctic Circle. Though this region of Nunavut is now a harsh Arctic ecosystem, at the time that Tiktaalik lived, the area was much farther south and was a subtropical floodplain. The Elders Council of Nunavut, the Inuit Qaujimajatuqangit, derived the formal scientific name for the new species, “Tiktaalik” (tic-TAH-lick). The Inuktikuk word means “a large, shallow-water fish.” The paleontology team works in Nunavut with authorization from the Department of Culture, Language, Elders and Youth. All fossils are the property of the people of Nunavut and will be returned to Canada after they are studied. A cast of Tiktaalik and a fleshed-out model of the animal are on display in the Evolving Planet exhibition at Chicago’s Field Museum. Private donors, the Academy of Natural Sciences, the Putnam Expeditionary Fund (Harvard University), the University of Chicago, the National Science Foundation, and the National Geographic Society Committee for Research and Exploration, supported the research.